It's the beginning of the Triodion! But what does "Triodion" mean? Great Lent is a beautiful time of year, and it's full of beautiful words that we're not sure we understand. In this episode, we'll consider those difficult words, and we'll talk about how we prepare ourselves and our families for Great Lent. 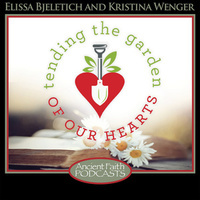 Kristina and Elissa read St. Luke's account of Christ's birth, stopping along the way to consider the many ways that God communicates His love to us.